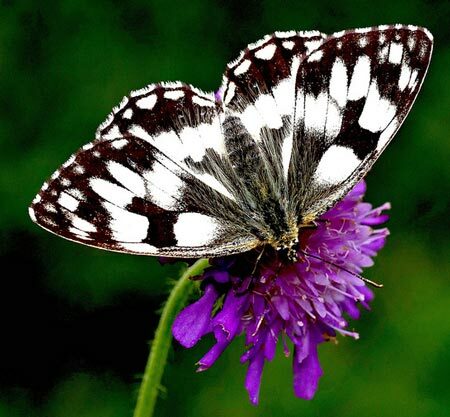 Special features: The only British butterfly with these distinctive markings. It is a black butterfly with white markings. The marbled white's eggs hatch in late summer and the tiny, cream coloured caterpillars hibernate amongst vegetation until the following spring. When they emerge they feed on various meadow grasses. Distribution: Found mainly in south west England. Scarce elsewhere. Habitat: Fields, meadows and woodland rides, especially on chalky soil.